Saule Abdrakhman-kyzy Batay was born in 1966 in Ust-Kamenogorsk, near the Altai Mountains in Kazakhstan. She studied philosophy at Rostov-on-Don State University, Russia (1983-88) and at the Kazakh Science Academy, Almaty (1991-94). 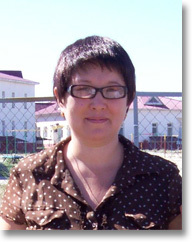 She has written a number of scholarly articles on national identity and religion in Kazakhstan. She is also a translator, who works in and between three languages: Kazakh, Russian and English. Her most noted translation to date is of a work by the philosopher Friedrich Nietzsche, ‘The Birth of Tragedy or Hellenistic Pessimism’ (Трагедияның жаратылуы немесе эллиндік пессимизм [Tragediyanyng zharatyluy nemese ellindik pessimism] – Almaty: Zhazushy, 2006). The book was published as part of a state-sponsored cultural project.